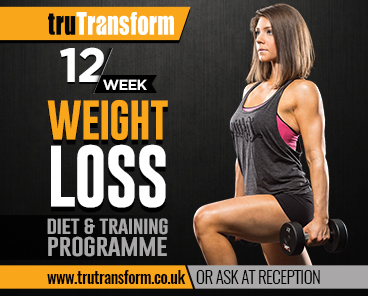 This programme is designed to help you make incredible changes to the way you look and feel in only 12 weeks. This is achieved with a 5 day a week combination of high intensity interval training and specific resistance based training, together with a tailored nutrition plan. To assist you, we've made video content available to show you how to perform each exercise correctly, and achieve the best results. Your local truGym will have qualified staff to help support you through your transformation. Our online programmes are available to download and work on both desktop and mobile devices. You can buy each of the phases separately, or scroll down to purchase the complete programme at a discounted rate. As part of the programme, we offer free nutritional and training support to help you achieve your goals. Our resident fitness expert, Nathan, is on hand to answer any questions and to assist you in your training regime and developing meal plans. Copyright ©2019 truTransform. All rights reserved.